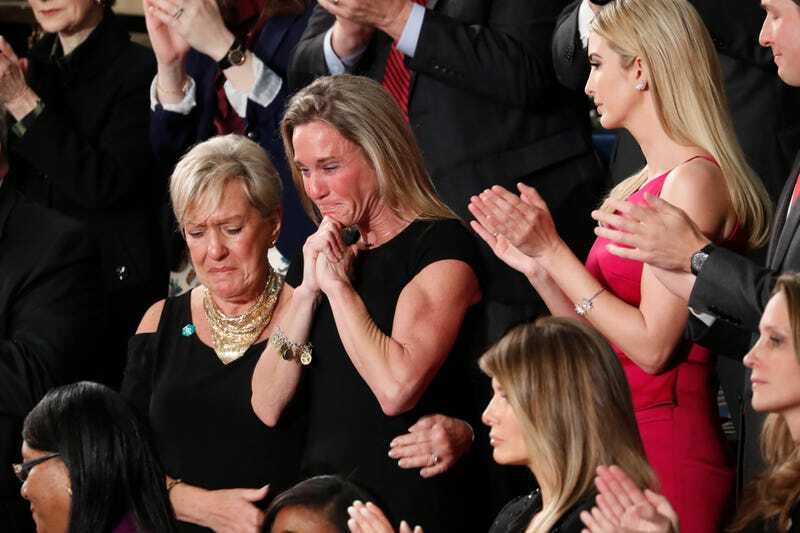 It is not an unfamiliar sight to see surviving family members of slain soldiers solemnly applauded during a State of the Union address or a joint session of Congress. But last night’s address to Congress from President Donald Trump—his first—was different, and that’s because, as more than a few veterans pointed out, it felt like the president was putting a widow’s grief on display to gin up support for his incompetent military decisions. When Trump acknowledged Carryn Owens, wife of Chief Special Warfare Operator William “Ryan” Owens last night, he started off appropriately by lauding Owens’ heroism. “Ryan died as he lived: a warrior, and a hero—battling against terrorism and securing our nation,” he said. That much is true, but so much of what the nation saw last night ignored what a catastrophe the raid was to begin with. Owens was killed Jan. 29 during a special forces raid on an Al-Qaeda compound deep into the Yemeni desert, along with 20 civilians and more than a dozen militants. Reports since then have indicated that Owens and his SEAL brothers were ill-equipped for what is said to have been a compromised mission that included a vicious firefight. The raid has since come under criticism for even being greenlit in the first place. But Trump had Carryn Owens on-hand during his Congressional address to spin a different narrative. He pivoted into a lie about how the botched raid, one he OK’d over dinner, returned critical intelligence. “I just spoke to General Mattis, who reconfirmed that, and I quote, ‘Ryan was a part of a highly successful raid that generated large amounts of vital intelligence that will lead to many more victories in the future against our enemies,’” he said. Of course, given that his administration and the military community, as of late, is leaking like a sieve, we know that U.S. officials have said the raid produced no useful intelligence. Even Senator John McCain said the raid was a failure. None of this matters to Trump. His reputation is so important to him that he is willing to use a grieving widow as a line of defense to evoke public support for his piss-poor decision making. Had he simply honored Ryan and Carryn, that would have been fine. But he didn’t. Instead, he turn the public’s sympathy for her grief into a PR stunt to rally attention to the most important person in that moment: himself. As the audience applauded for what was quite a long time, Trump added, “And Ryan is looking down, right now, you know that? And he’s very happy, because I think he just broke a record,” meaning a record for applause. A record? Really? Trump was clearly talking about himself and how his words were able to generate such a long ovation. Even if Trump was sincere, why would he trivialize the death of Carryn’s slain husband by quantifying the emotional empathy of those paying tribute to her sacrifice? Again, honoring the troops and their families is no new tradition at these things. Former President Barack Obama honored Sgt. First Class Cory Remsburg, who suffered brain damage after a roadside bomb blast in Afghanistan, during the 2014 State of the Union. “Like the Army he loves, like the America he serves, Sgt. First Class Cory Remsburg never gives up, and he does not quit,” Obama said, addressing the Remsburg family. But Obama kept it there. This was different. It felt deeply exploitative, and again, it ignored what a mess the raid itself was. Read the replies to see more, if you’re curious. Indeed, Owens’ own father, Bill Owens, saw the situation differently. He declined a meeting with Trump and instead has demanded an investigation into what happened—one that has since been denied. “I told them I didn’t want to make a scene about it, but my conscience wouldn’t let me talk to him,” Owens said Friday, speaking out for the first time in an interview with the Miami Herald. Owens, also a military veteran, was troubled by Trump’s harsh treatment of a Gold Star family during his presidential campaign. Now Owens was a Gold Star parent, and he said he had deep reservations about the way the decision was made to launch what would be his son’s last mission. [...] Bill Owens said he was assured that his son, who was shot, was killed early in the fight. It was the first military counter-terrorist operation approved by the new president, who signed the go-ahead Jan. 26 — six days into his term. This isn’t the only time Trump demonstrated classlessness towards a military family. As our friends over at The Concourse wrote today, Trump’s speech to the joint Congress last night was rife with racism and xenophobia, but that’s nothing we haven’t seen before. Last night, though, his handing of Carryn Owens showed another side of him: that he would even exploit the grief of a dead SEAL’s wife if it meant scoring political points.